Our courses are thought over 2 days for each level, with the first day comprising of hands on tuition and driving on the track learning the techniques to complete the specific requirements for the test. Day two recaps on day one with more time to refine on any issues from day one before your test in the afternoon, on sucessful completion of your test you will then be shown the next level to give you a taste of what to prepare for next time. 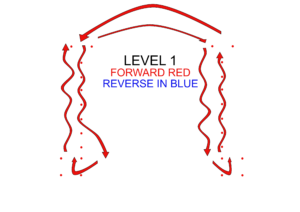 To complete the level 1 course you will be required to tackle our high speed forward slalom, down the straight around the bend and down the second straight, then perform a high speed 180 degree turn into a box, then high speed forward slalom again, down the straight around the bend and down the second straight to perform a second high speed 180 degree turn into the second box, from here you will complete a high-speed reverse around a bend back into the first box and continue down the slalom course inverse weaving in and out of the cones around the bend and down the final straight and back into the box. This has to be completed in a set time of 2 mins 30 seconds without touching any cones. You will be given 3 runs to complete the test in you may use two for practice but the must say before hand which is your test run. 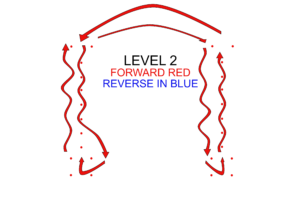 To complete the level 2 course you will be required to tackle our high speed forward slalom, down the straight around the bend and down the second straight, then perform a high speed 180 degree turn into a box, then high speed forward slalom again, down the straight around the bend and down the second straight to perform a second high speed 180 degree turn into the second box, from here you will complete a high-speed reverse around a bend back into the first box and continue down the slalom course inverse weaving in and out of the cones around the bend and down the final straight and back into the box.From here you will drive forward and high speed and slide the car in 90 degrees into a box park on your drivers side, you will then drive forward out of the box and turn the car around so you can drive straight down the track to perform the same 90 degree box park on the passenger side. This all has to be completed in a set time of 2 mins 30 seconds without touching any cones. 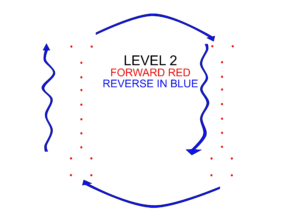 To complete the level 3 course you will be required to tackle our high speed forward slalom, down the straight around the bend and down the second straight, then perform a high speed 180 degree turn into a box, then high speed forward slalom again, down the straight around the bend and down the second straight to perform a second high speed 180 degree turn into the second box, from here you will complete a high-speed reverse around a bend back into the first box and continue down the slalom course inverse weaving in and out of the cones around the bend and down the final straight and back into the box.From here you will drive in reverse and perform a high speed 180 turn ( J turn ) and slide the car in 90 degrees into a box park on your drivers side, you will then drive forward out of the box and turn the car around and so you can do another J-turn before continuing to drive straight down the track to perform the same 90 degree box park on the passenger side. This all has to be completed in a set time of 2 mins 30 seconds without touching any cones. 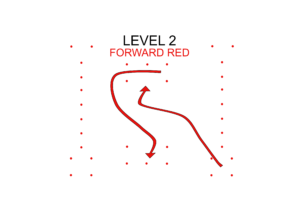 To complete the level 4 course you will be required to tackle our high speed forward slalom, down the straight around the bend and down the second straight, then perform a high speed 180 degree turn into a box, then high speed forward slalom again, down the straight around the bend and down the second straight to perform a second high speed 180 degree turn into the second box, from here you will complete a high-speed reverse around a bend back into the first box and continue down the slalom course in reverse weaving in and out of the cones around the bend and down the final straight and back into the box.From here you will drive forward and perform a high speed 180 ( to the right )into a reverse parallel park then put the car into reverse and perform a high speed 180 turn ( J turn ) and slide the car in 90 degrees into a box park on your drivers side, you will then drive forward out of the box and again perform a high speed 180 into a reverse parallel park on the opposite side ( to the left ) then continue so you can do another J-turn before continuing to drive straight down the track to perform the same 90 degree box park on the passenger side. 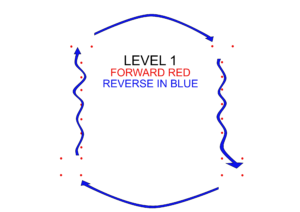 To complete the level 5 course you will be required to tackle our high speed forward slalom, down the straight around the bend and down the second straight, then perform a high speed 180 degree turn into a box, then high speed forward slalom again, down the straight around the bend and down the second straight to perform a second high speed 180 degree turn into the second box, from here you will complete a high-speed reverse around a bend back into the first box and continue down the slalom course in reverse weaving in and out of the cones around the bend and down the final straight and back into the box.From here you will drive forward and perform a high speed 180 ( to the right )into a reverse parallel park then put the car into reverse and perform a high speed 180 turn ( J turn ) and slide the car in 90 degrees into a box park on your drivers side, you will then drive forward out of the box and again perform a high speed 180 into a reverse parallel park on the opposite side ( to the left ) then continue so you can do another J-turn before continuing to drive straight down the track to perform the same 90 degree box park on the passenger side. Once you have accomplished all this the hard work then begins, you will be required to tackle the course from the opposite end, then it will be compulsory to tackle it with a LHD car and also complete manoeuvres in synchronisation with other drivers, you will also need to master precision drifting, 270 degree box parks and the extreme high speed rolling 360 degree. This all has to be completed in a set time of 2 mins 45 seconds without touching any cones. One level 5 you must complete the test twice in your 4 runs.